The Unnaturalists has been on my wishlist for ages. I love the idea of separate Londons and cataloging jobs at museums, and I’m a sucker for those old English stories about girls on the brink of being ladies and who face the growing pressure of finding a husband, though they themselves have other wants and other plans. 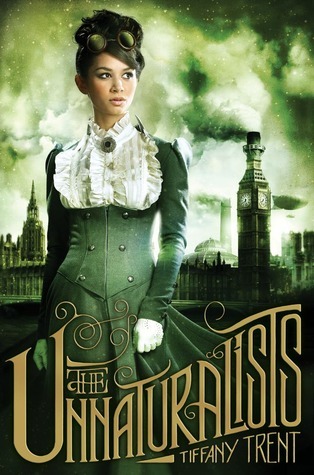 Contrary to what the cover, eye-catching blurb, and synopsis says, however, this was none of these things – The Unnaturalists was a tangle of interesting ideas that hadn’t been fully developed into a story, melded together with excessive info-dumping, an unfeeling romance, and cheap plot twists, then topped with elements that left me more than a little uncomfortable. The chapters alternate between Vespa’s first person POV and Syrus’s third person POV, but strangely, I didn’t mind. Rather, I was more thrown off by the characters themselves. It’s a sweet idea in theory, but the execution… The author uses Mandarin, but only scarcely – Syrus calls his grandmother nainai, the heavenly dragon is called tianlong, and he also says “wo shi” at one point (page 172 in the paperback), which the author translates into “I will,” but really means something more like “I am,” which doesn’t make sense in context. And before I delve into a convoluted ramble, full discloser: for what it’s worth, I’m Taiwanese Japanese, and converse with the Taiwanese side of my family in Mandarin and Taiwanese. So now that’s out of the way. I think it’s super cool and pretty sweet of the author to want to give something back. I think it’s great that the author wanted to incorporate different languages into her story. And, hey, maybe I’m being nitpicky – I try not to read reviews before I finish my own, but a cursory glance around says no one else has raised this as an issue – and maybe I’m just being a bit more sensitive and overreacting because of the times we’re in. But, firstly, I feel like if you could provide a “sacred language” version of Heavenly Dragon (tianlong), could the same not also be done for other crucial words and phrases in The Unnaturals, such as the Heart and Elementals and Manticore? Honestly, I didn’t even fully realize the “Tinkers” had a sacred language, let alone that it was actually Mandarin until I read the author’s note. If you’re going to introduce another language, introduce another language! Sprinkle in some words here and there – let it leave its mark! If you’re going to do something, let it be known that you’re doing it! Especially if it’s their sacred language, and you’re trying to define a culture. I’ve lightly scanned the book a few times, and could only find the three instances I mentioned before. Maybe there’s more – I hope there’s more! But it’s pretty disappointing? To have underdeveloped this part to such a degree. It feels half-assed – thrown in as an afterthought, just for the sake of being able to include a note on it at the end of the book. And, please, if you’re going to use another language, especially one that you may not feel 100% comfortable with, please please check it with someone? The most spoken language in the world is Mandarin – I’m sure someone would be willing to help. I know I’d be. And then, of course, her beaten-down Tinkers use Mandarin, but the Architects – “one of the most powerful, devious, and wanted sorts in all the Empire,” as per the author’s own words – use Latin. I.e. in page 41 of the paperback, where one of their spells reads “Et in Arcadia ego.” So. Um. There’s that. Yeah. I’m going to cut myself off before I go on anymore because this review is turning into a mess but TL;DR: the fact that the author dedicated half of her author’s note to talking about using Mandarin in her novel, but only used it extremely sparingly and almost unnoticeably, and still ended up erring once when she did so didn’t make me feel too great, especially when coupled with the aforementioned other uneasy things I found about her Tinkers. Bayne’s tolerable only because he provides a break from Vespa, and I honestly think the twist in their relationship could’ve been prevented had Vespa thought for longer than a second; the plot does show its face, and the setting is wildly fascinating, but the novel overall is greatly burdened by The Unnaturalist’s flaws; the ending felt vague and muddled, least of which because of the abrupt and late introduction of a rather big character. I had more thoughts on The Unnaturalists, but after putting all the thoughts I already had into words here, I think I’m going to go read something else and clear my mind. Yep. That seems like a good idea.